It wasn’t all that long ago when the typical campsite was illuminated by little more than a fire and moonlight. The advent of the LED has radically changed how we see at night, and with every successive season new lights enter the market. There are so many lighting options available now, it is hard to know which versions are worth your hard won cash. 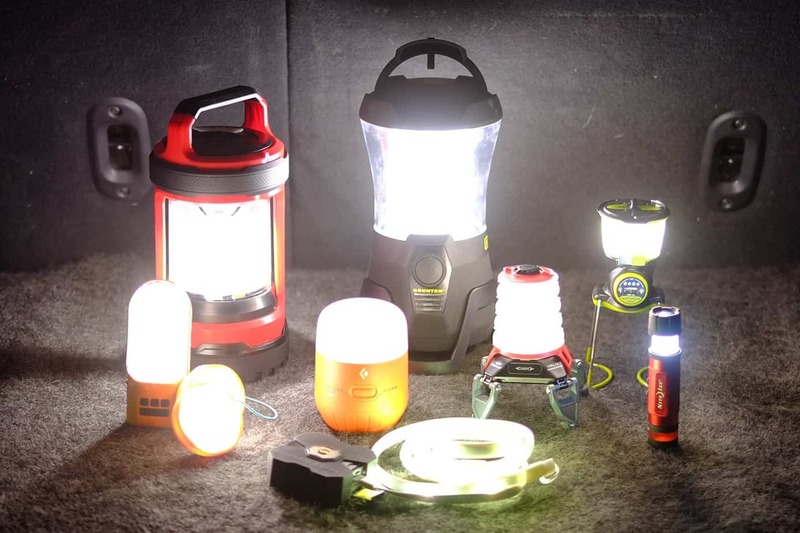 With the camping season in full swing, I set out to evaluated some of the best LED lighting solutions to see how they stack up. 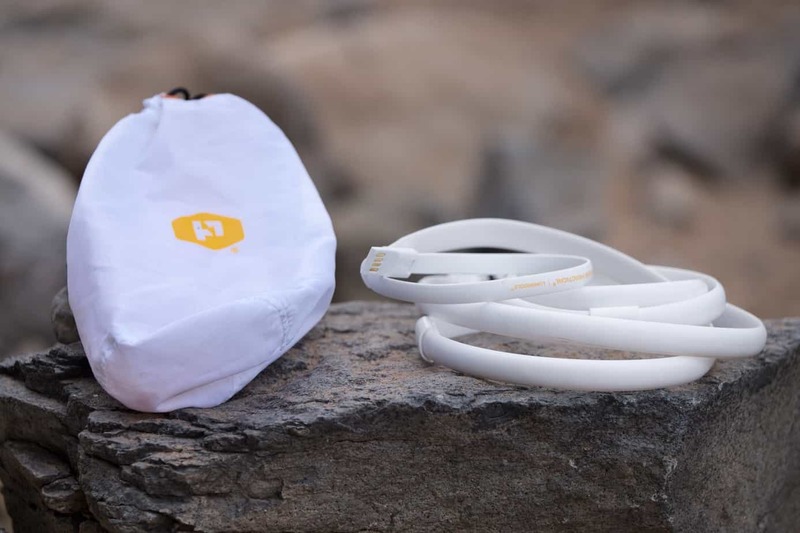 I tested lights that could play music, charge your phone, and even draw power from the sun. Black Diamond’s Titan, Apollo, and Orbit lanterns have been my go-to lighting solutions since they were first released in 2011. While I have no real need to replace them, I was excited to put Black Diamond’s new Moji lanterns to the test, namely the Charging Station. 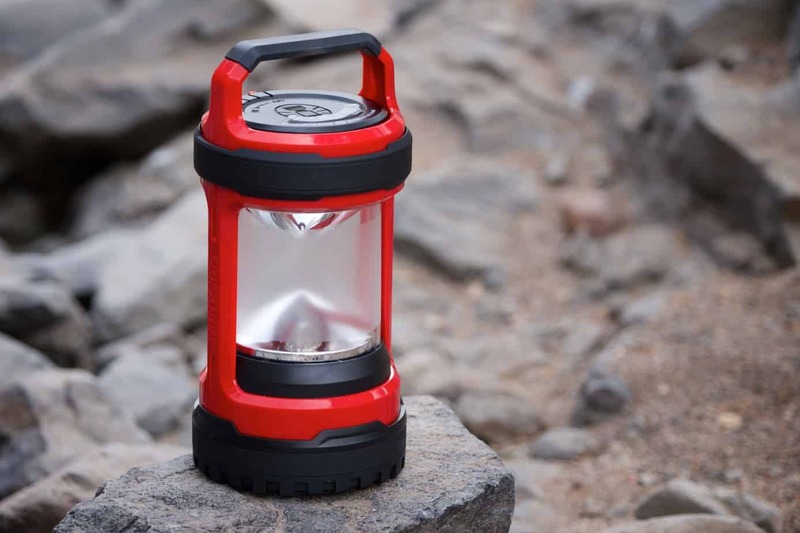 At just 430 grams with a compact 4×3.5-inch size, this is a great lantern for all camping scenarios. 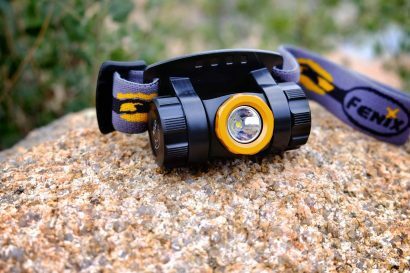 Capable of producing a variable range of light from 10 lumens to an impressive 250, the Moji can burn for up to 50 hours on the highest setting, and 150 at the lowest. Adding to its utility, the Moji Charging Station is powered by a Li-ion battery pack augmented by four AA batteries. As the name would imply, the Charging Station can be used to power mobile phones and other handheld electronics via a single USB port. The frosted globe produces a bright glow without any harshness and the double-loop hook allows the Moji to be placed overhead securely. Although small in stature, the Moji can broadcast light in a 45 foot radius. Verdict: This is a great light and the lack of any folding or collapsing components is nice. 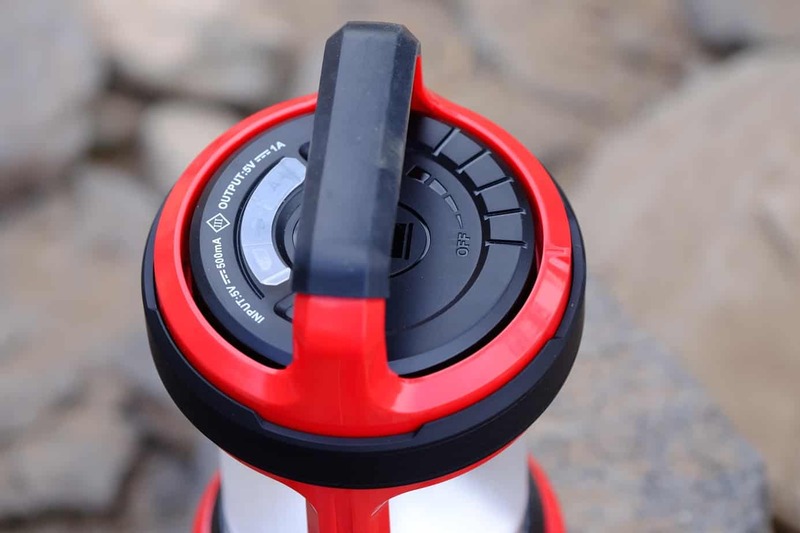 The rounded edges allow it to slip within the snug confines of any bag, and the variable light output ensures just the right amount of soft glow for any task. The added backup of AA batteries is genius. The Lightwave Amp is the most full-featured lantern in this review––bar none. Aside from its retina-searing 750 lumen output, it can also cast light in five different colors in an array of strobing, pulsing, and steady patterns. Sound like a disco party? It is when you wirelessly connect the Amp to your smartphone or tablet via Bluetooth to pump your jams through the built-in speaker. Unlike most wireless sound systems, the Amp’s speaker sounds fantastic with excellent tonal range. The 20,000mAh battery can provide up to 13 hours of light at full power with the speaker in use, and dual 5V/2.1A USB outputs allow handheld devises to be recharged simultaneously at rapid charge speeds. Adding to the convenience of the Amp is the Brunton B-Sync mobile app which wirelessly connects the lamp to your phone or tablet. I know that sounds wholly unnecessary, but it is a feature I have used more frequently than I thought I would. It is not particularly small at 11×6.5-inches, and it weighs over 3-pounds, but it is built exceptionally well and weather resistant. Some may find the price a bitter pill, but considering it is a speaker, charging station, and a high powered light source with full remote controls, I feel it is a good value. 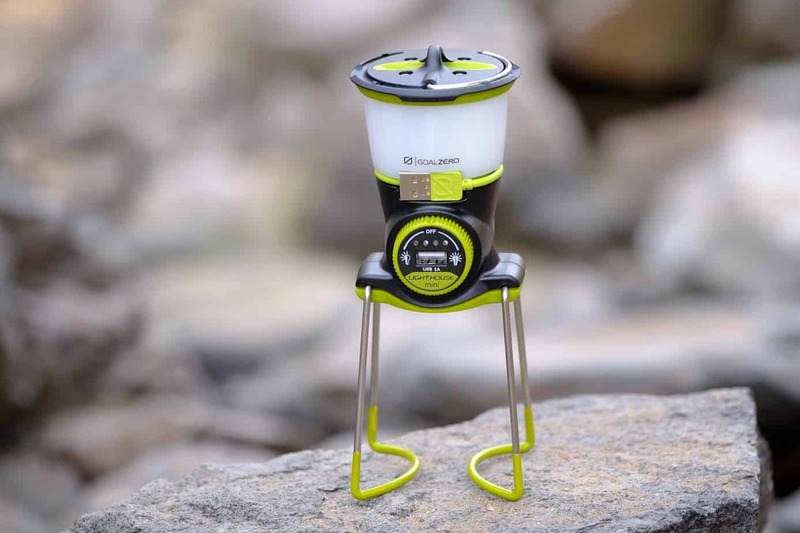 If you want to spice up your group camping scene, this is the lamp to have. Verdict: This lamp is clearly over the top, but as crazy as it sounds, it is fun to use and convenient. 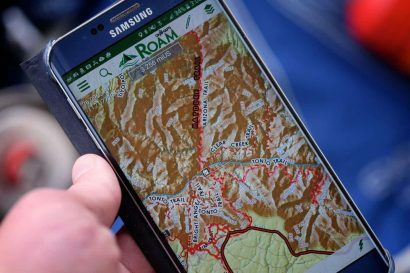 The wireless app does come in handy when turning the light on and off without crawling out of my sleeping bag. The sound is amazing and it charges quicker than I anticipated. It is also the brightest light in this review by a considerable margin. This is one of my favorite finds of the year. Versatility scores high with me and the BioLite NanoGrid offers several useful features not found in other lights. The core of the NanoGrid system is the PowerLight, a 250 lumen dual-beam flashlight with an additional 200 lumen bi-directional lantern. Powered by a 4400mAh li-on battery, the exact type built into the Tesla electric car, it can be used to recharge handheld devices via a USB port or power the SiteLite daisy-chained auxiliary lights. 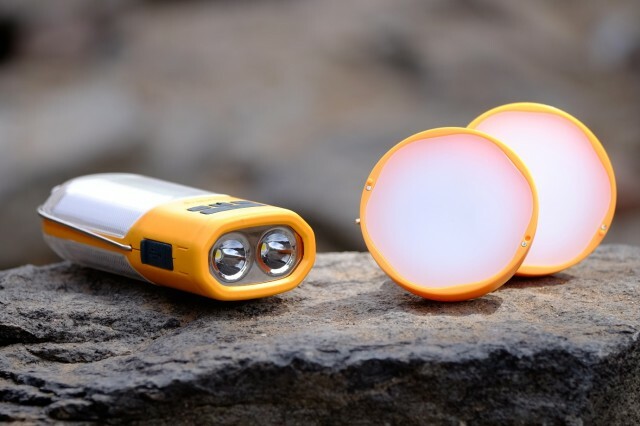 Used on its own, the PowerLight is small enough to fit in a pocket and only weighs 7-ounces. 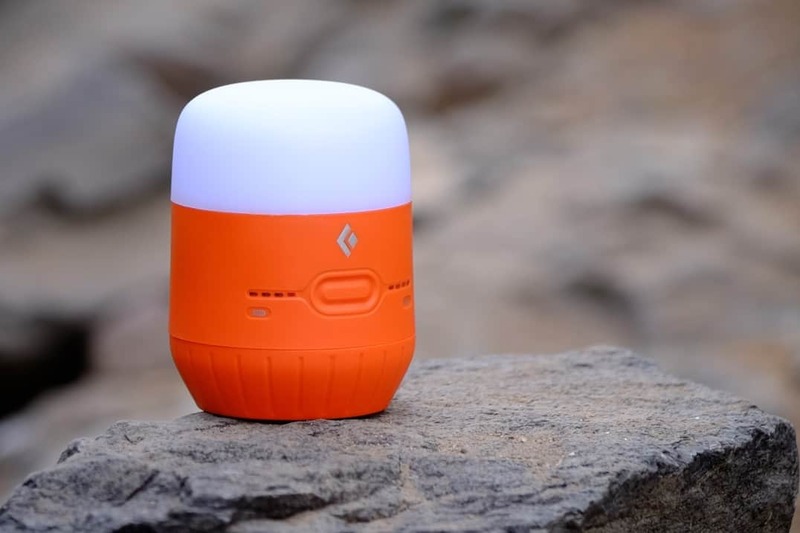 With enough power to recharge most phones at least twice, the PowerLight is useful day or night. 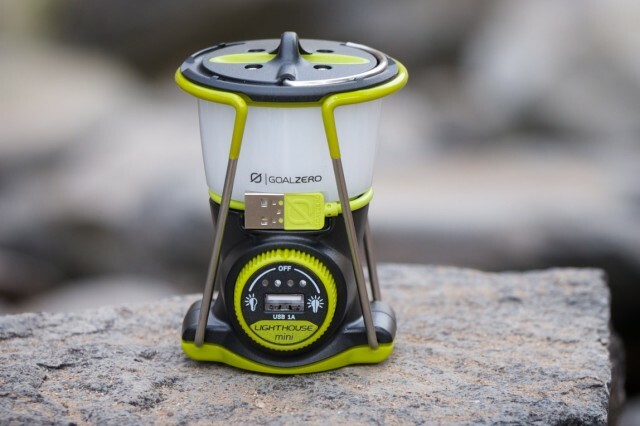 When connected to the two SiteLite lamps, the three components make up one of the best cooking or tent lights I have ever used as the multiple light sources eliminate the heavy shadows that emanate from a single light source. The clever design of the SiteLites keeps the cords stored securely in transit, and each lamp can be powered on or off independently. If you need to light a large area with a compact system, there is no better solution that the NanoGrid. Verdict: I genuinely love this light. Placed within a tent, or over a cooking station, it produces nice even lighting for a wide area. Each satellite light has enough braided wire to connect lights across an entire camp. I find I keep the main flashlight component in my pocket all night when not in use. There are not many things worth buying for less than $20, but the Luci Light is one of them. 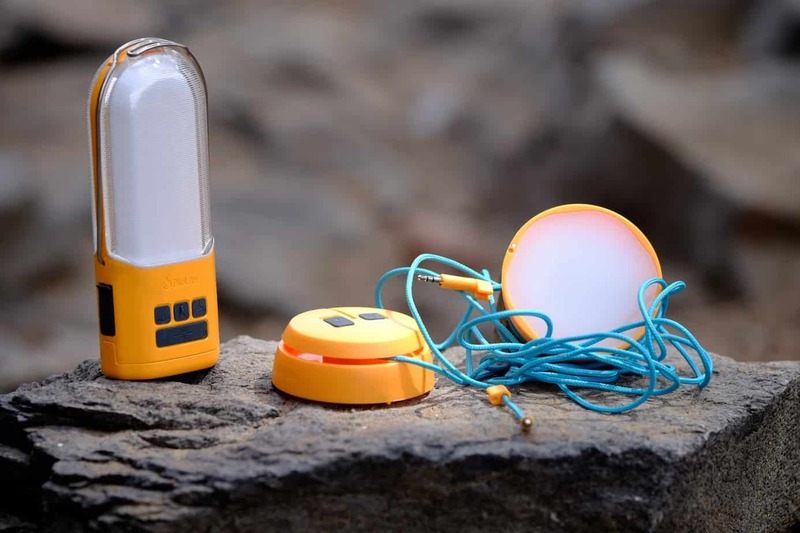 This popular LED light, powered by a built-in battery and charged by a tiny solar panel, is not just useful, it has a feel-good story behind it. 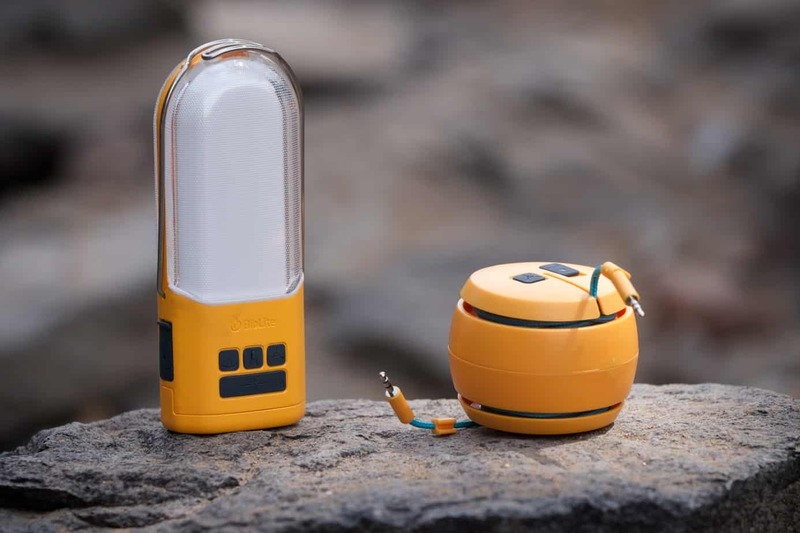 The founders of MPOWERED created their inflatable lantern to help provide light to the 1.5 billion people of the world living without electricity. 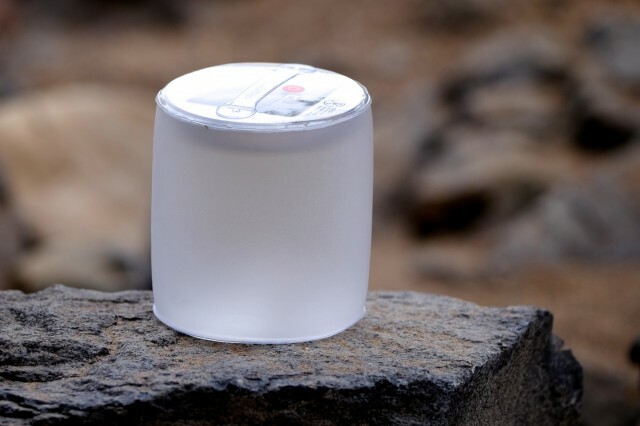 For $10, you can donate a Luci to someone in need and they will dispatch it to the far corners of the globe. 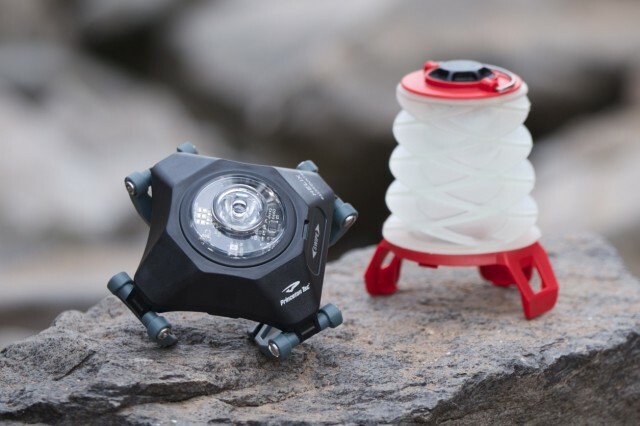 Although they are available directly from the MPOWERED website, and sold on various outlets like Amazon, you can often find the Luci Light at your local hardware store or outdoor retailer. Verdict: For $15 you can’t go wrong. Buy one for your glove box or emergency bag. They do take 8 hours to charge, which can be a bit of a pain. I have always had a soft spot for the Coleman brand which is based in my home state of Kansas. Billed as “The Outdoor Company,” Coleman has inspired millions of people to load up the car and get out of town. Who among us has not used a Coleman lantern or two-burner stove? 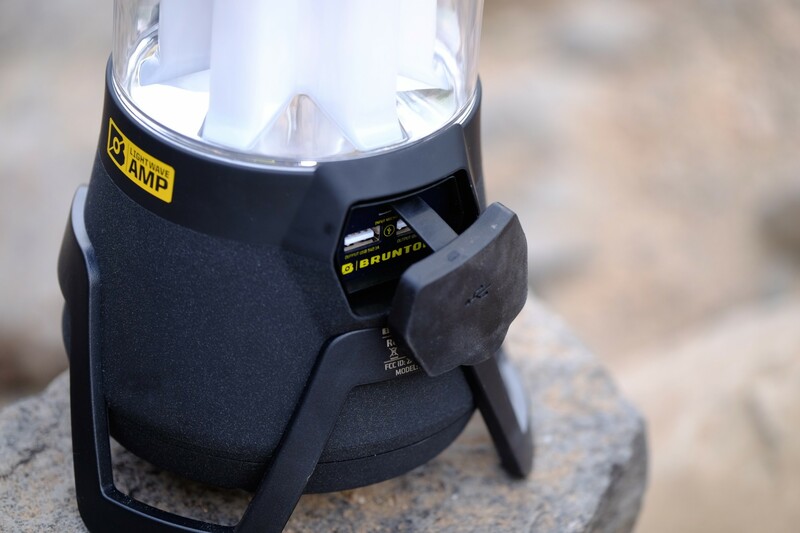 They have always made their equipment affordable to everyone and their $65 Spin 550L lantern is the best value of any light in this review. 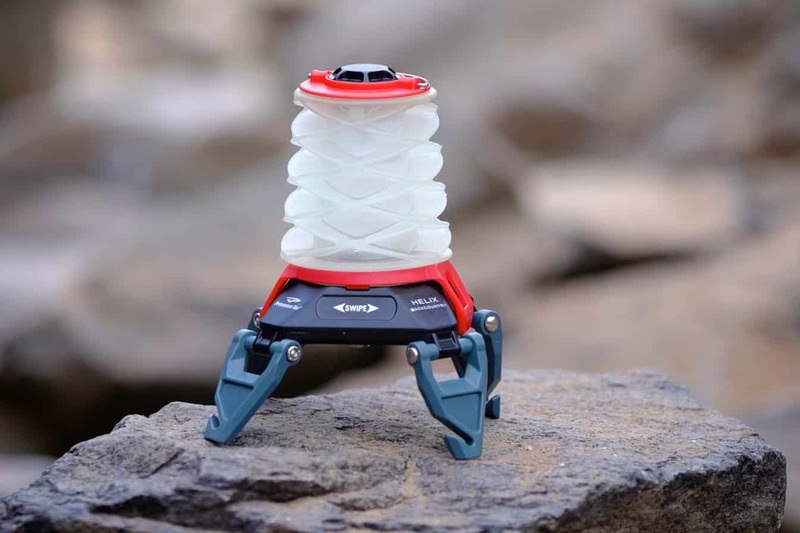 With 550 lumens powered by a rechargeable battery, the Spin has four output levels and can run on the highest setting for up to 15 hours. An innovative Battery Lock system allows the batteries to be completely disengaged from the power contacts during long-term storage. It can also be used to charge handheld electronics. One nice design touch is the internal storage compartment that houses the charging block and USB cable. Verdict: This is a value that can’t be beat, but there are some minor missteps in the design. It is a large lantern and the light it produces can be a bit harsh on the eyes. The on/off dial is a little fickle and it takes 12 hours to charge. But, for $65 it really is hard to complain about such minor quips. This is another product that should cost way more than $20, if for no other reason than the cool factor. A five foot long waterproof strip of 26 individual LEDs, the LumiNoodle can be powered by any USB compatible energy source. 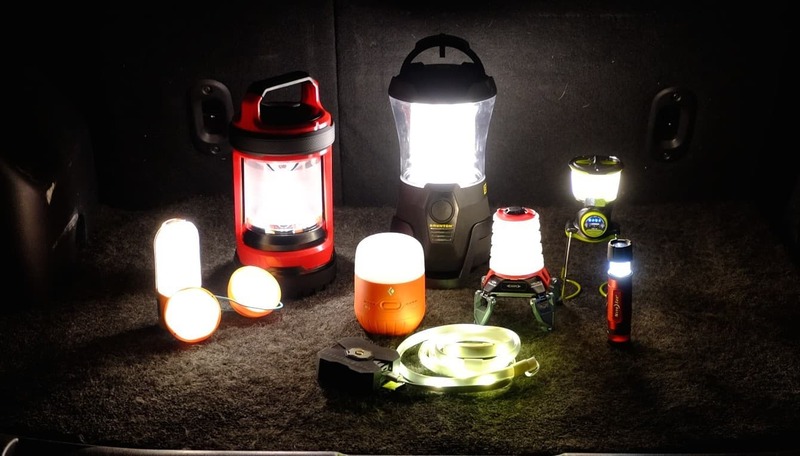 When used inside a tent or placed above a tailgate, they provide a soothing glow with no harsh shadows. If you don’t feel inclined to hang them in a long strip, you can leave them bundled in the translucent carrying bag which illuminates like a frosted globe. Each LumiNoodle strip comes with three rubber attachment bands and a nylon loop at the far end for multiple hanging options. Better yet, the strip has magnetic contacts which allow it to be quickly attached to any steel surface. Surprisingly bright at 180 lumens, the LumiNoodle is available in 5 and 10 foot lengths, with or without a 4400mAh power pack. Verdict: I dare you to buy a Luminoodle and not brag about it to your camp mates every time it gets dark. I love this thing and use it more often than I ever thought I would. 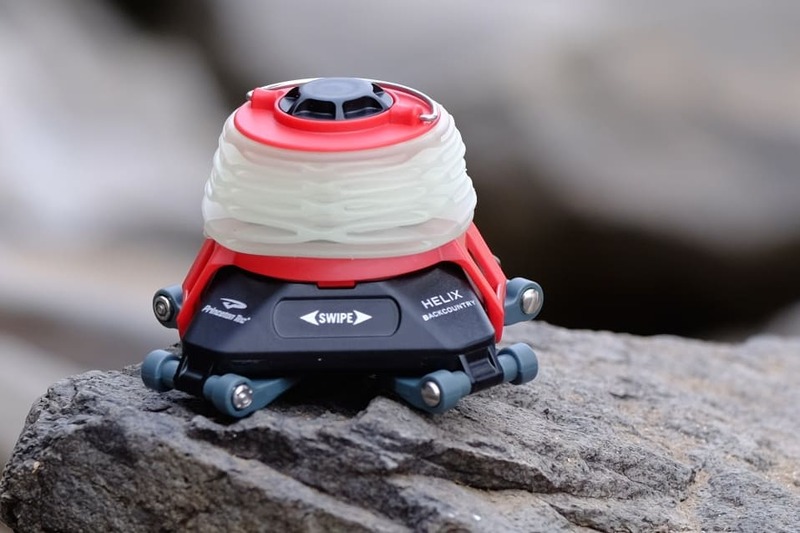 Call me a sucker for cool designs, but Princeton Tec’s line of Helix lanterns won my undivided attention before I ever hit the power button. The distinctive collapsable rubber globe and the folding legs don’t just look great, they’re multi-functional. 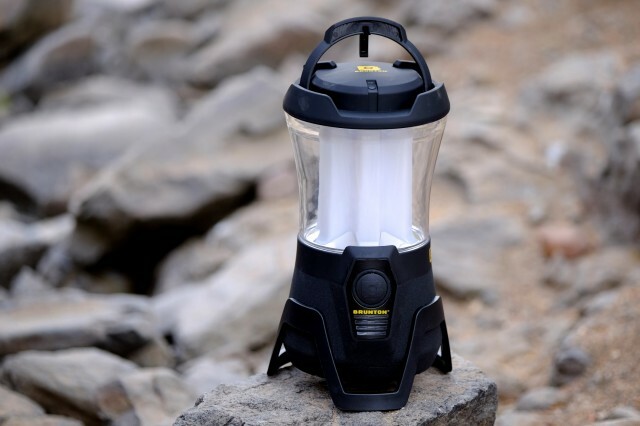 The Helix lantern line is available in two sizes with the Backcountry the smaller of the two, but it still produces powerful 150 lumens on the high setting and 30 on low. The unique power button responds to a swiping finger motion and the globe can be removed for a more focused beam of light. The folding legs allow for a number of hanging and standing configurations. The globe produces a soft glow that isn’t hard on the eyes and when switched off it glows in the dark. Verdict: If you need a small, versatile lantern at a very reasonable price, this is one worth buying. The swiping on/off switch can be cantankerous at times, and folding the legs out can be challenging, but it is an otherwise very nice little lamp. Perfect for motorcycle touring where space is a premium. 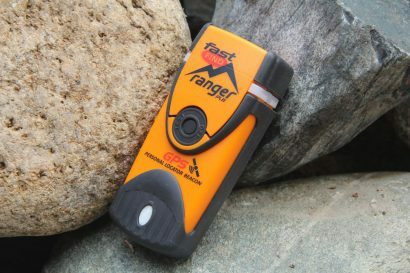 All of us at Expedition Portal were early adopters to Goal Zero and their entire catalog of products. 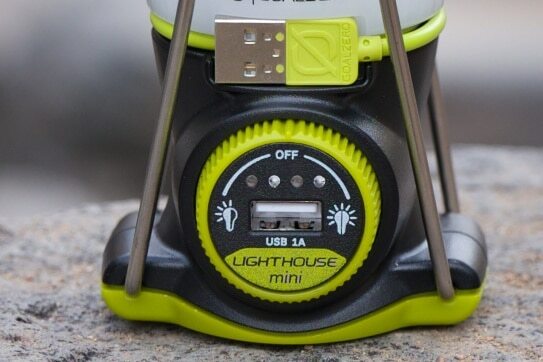 One of their latest offerings, the Lighthouse Mini, is a staff favorite. 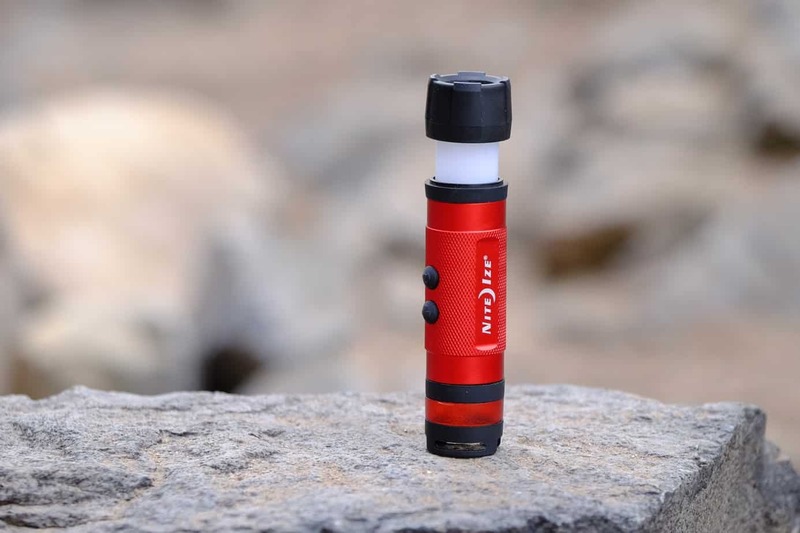 Although small enough to fit in the palm of your hand, it cranks out 210 lumens on the highest setting and can burn for 500 hours on the lowest. With a 1A USB port for charging handheld devices, the 3,000mAh battery has enough juice to charge most mobile phones at least once. The Li-NMC battery within the base of the Lighthouse can be removed and a freshly charged battery put in its place. 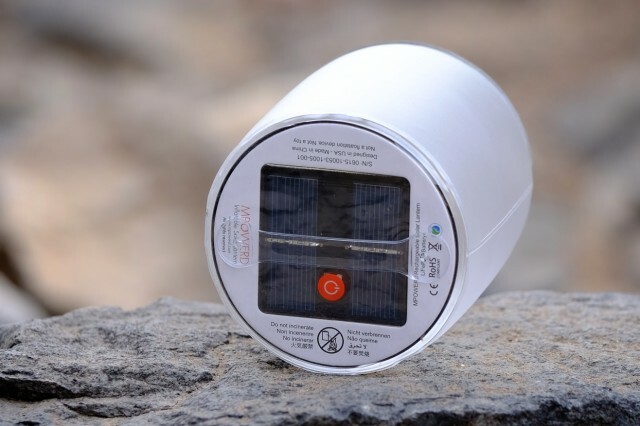 The Lighthouse can also be recharged with a Goal Zero solar panel, or with any Goal Zero power pack. Verdict: I like the ability to insert a fresh rechargeable Goal Zero 18650 battery into this unit, as well as the infinitely dimmable LED lights. The folding legs place the light beam high above table level and two attachment options allow the light to be placed easily overhead. I stumbled across the Nite Ize 3-in-1 purely by accident. A promotional gift from a trade show, I slipped it in a drawer, quick to dismiss it as just another cheap freebie. Months later the power in my house went out and as I reached for my fancy $200 boutique flashlight, I inadvertently grabbed the 3-in-1. It has been in my glove box since. With a high setting of 80 lumens the single AAA battery can power the light for up to 2 hours, or 9 hours at the lowest setting of 15 lumens. Light can be focused through the flashlight lens or via the slide-out lantern globe in either red or white light colors in steady, strobing, or SOS flashing patterns. Verdict: Cheaper than a twelve pack. What more do you need? There are so many good lights on the market, but after several months of searching for the best, I landed on this list. None of them are terribly big, with a couple of exceptions. Most will work for any type of backcountry travel, and if you need me, I’ll be jamming out to the Brunton Amp around camp.